NAU is committed to providing a high-quality education for our students with a solid mission, vision, and set of core values. These web pages provide information, useful resources and reports, and an archive on strategic planning at Northern Arizona University. Northern Arizona University engages in thoughtful planning processes to fulfill its responsibilities to Arizona as a public university and to allocate state funds and tuition revenue effectively and with transparency. State of Arizona requirements and Arizona Board of Regents expectations are the foundations of the NAU processes. At the university level, strategic planning is coordinated through the division of Finance, Institutional Planning, and Analysis and informed by the members of the Strategic Planning and Budget Council and President’s Cabinet. 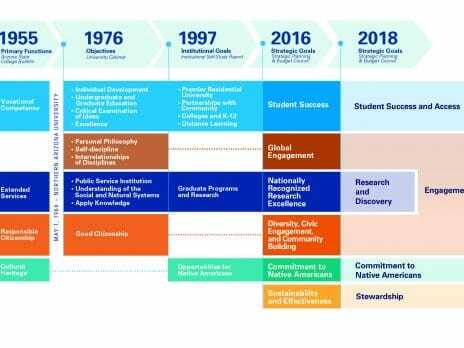 Divisions and other lower-level units use the university strategic plan as a framework for their planning and budgeting efforts. After a Visioning Process with extensive stakeholder input and feedback, the new Northern Arizona University Strategic Plan has just been released by the president.